Liverpool - a 3-3 draw at Liverpool headquarters makes Arsenal manager, Arsene Wenger, disappointed. Wenger laments his inability to lock the victory sooner. 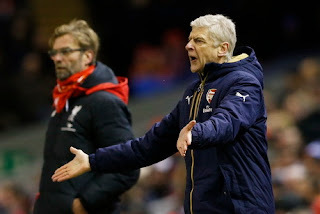 Arsenal took home one point from the match at Anfield on Thursday (01/14/2016) pm dawn. The Gunners failed to win even a 3-2 lead until the final minutes of the match. Arsenal left by Roberto Firmino scored in the tenth minute. They then equalized through Aaron Ramsey shot four minutes later. Firmino shot from outside the box in the 19th minute to make Arsenal left again. However, Olivier Giroud flick in the 25th minute as strong change the score 2-2, which lasted until halftime. Giroud brought Arsenal back ahead 3-2 over the tally in the 55th minute. The score did not change until substitute Joe Allen goalkeeper Petr Cech in the 90th minute. Arsenal victory is in sight was floated. "I am very disappointed. But, overall, I can not blame the effort and commitment of the team," said Wenger told BBC Sport. "We had a tough start. In the 3-2, we should have changed the score was 4-2 and we did not make the right decisions in the final third of the pitch. Liverpool fought until the last second," he said. "I think we got a great start worrying. We've got some bad memories from the game a few years ago and you can still see it in some players. We were 0-1 and then we started to play. We came out of the game with a lot of positive things, but still there are some regrets, "said Wenger. 0 Response to "Wenger Very Disappointed"